At the Cabinet Joint, it is our goal to make it as easy as possible for you to realize the kitchen, bath, or home office of your dreams. 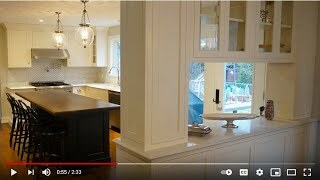 Watch the video or read on to learn more about us and Conestoga Wood Specialties to find out what makes our products and services different from any other RTA cabinets you will find! By partnering with Conestoga Wood Specialties, The Cabinet Joint offers the industry’s finest cabinetry products from kitchen cabinet doors and drawer fronts to complete RTA cabinet systems , covering several price points from entry level to high-end luxury. We aim to set our brand apart by offering not only the finest wood cabinet components you can find, but a wealth of advice and counsel on how to design, order, build and install the finest cabinets you can buy. What makes us different from other ready to assemble cabinet companies you’ll find on the internet? At the Cabinet Joint, we don’t just sell our products—we use them every day in our own cabinet operation. We take pride in our products and have a great deal of passion for what we do. Furthermore, our dedication to fine cabinetry and superior craftsmanship gives our clients the opportunity to tap into a vast, 30 year knowledge base of product details, ordering processes, project design and planning, technical specifications, tools, equipment, and much more. Whatever it is you need for your cabinetry project, we’ve got you covered! Since 1964 Conestoga Wood Specialties has manufactured the highest quality doors and wood components in the kitchen cabinet industry. From their modest beginnings in a small garage in Lancaster County, PA over four decades ago, they have grown into the industry leader known for their dependability in both product performance and on time delivery. Through continuous refinement of their processes and the constant updating of equipment, they combine the best that technology has to offer with over 1,000 trained and dedicated craftsmen, ensuring that their products will always meet or exceed their customer’s expectations. Conestoga’s manufacturing capabilities are spread across eight facilities strategically located throughout the United States. The location of these facilities allows them to better understand and service the needs of the regional markets and minimizes transportation time and expense to their customers, no matter where they may be located. Above all, Conestoga offers a level of dependability that is unsurpassed. Whether you purchase our doors, moldings, drawer boxes, ready to assemble cabinetry or any of the hundreds of accessories and ancillary items they offer, Conestoga is totally committed to providing the quality products you need, when you need them, with a company wide shipping record of over 99% complete and on time, every day. At Conestoga, they understand that relationships are built one delivery at a time. Having partnered with them for many years (our owner having even worked for Conestoga in a number of capacities including product development and sales), we can personally attest to their incredible performance and product quality. We are proud to bring this professional grade product to the DIY market, allowing home owners to experience the Conestoga brand first hand.